This ensemble cast captures the spirit of rebellion and freedom from the 1960s and re-creates the confusion, conflict, and strange sense of hopefulness from the era.One word of warning for those unfamiliar with the musical -- there's not much of a plot to follow. A good portion of the first act serves as an introduction to our central characters, Claude (Brendan Sheehan), Berger (Jeff Hunsinger) and Woof (Adam Montgomery) -- followed by declarations by song on everything from the Vietnam War to drug use to open sexuality. 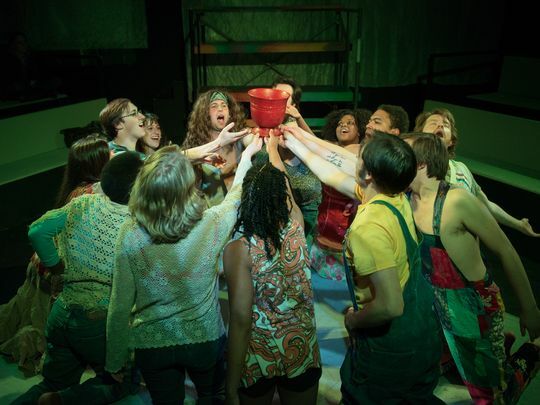 While there are a few winks and nods to current cultural conflicts, this production of Hair remains firmly planted in the Age of Aquarius. The timeless elements remain as poignant as ever -- the conflict between a young adult and his parents, the search for an identity and a group of friends, and the difficulty of intimacy in the midst of open relationships. Director Michael Gray and choreographers Tommy Fisher-Klein & Dawn Morningstar turned the entire room into the stage, allowing the actors to interact with the audience at a new level. Of course, it's the 40+ songs that drive Hair, and music director Joe Trainor takes advantage of this position, exploring every facet of the musical styles featured from doo-wop to country to rock to the experimental psychedelic sounds of the 60s. Back to the ensemble: Through most of the production, the audience sees, hears and experiences all 13 actors/singers/dancers as their lines, voices and bodies flow, merge and intertwine. The voices are both powerful and refined, expressing the boldness of youth with just the right amount of underlying uncertainty. If you lived through the 60s and want to take a trip down memory lane, this production will have you smiling fondly at the passion of youth. If you're younger, you might be able to see how this musical paved the way for musicals like Rent and Green Day's American Idiot. Hair is playing April 1-9 at the Black Box at 4 South Poplar Street in Wilmington. For tickets, go to city-theater.org.